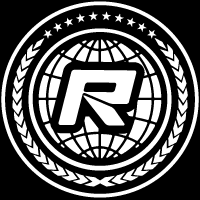 Xray have introduced the GTX8, the latest evolution of their 1/8th GT platform based off their successful XB8 1/8th offroad buggy. Featuring a whole wrath of changes that includes all new front & rear diffs with increased oil capacity to increase traction & consistency, other changes include new front upper arms with reduced caster to improve the steering characteristics and decreases tire wear. Harder lower front arms aim to increase response and corner speed, while car’s backbone, the chassis fits soft & hard radio trays to adjust flex for various track conditions. In the back of the car there is new rear uprights with 8x16x5mm outer ball-bearings for increased reliability and lifespan, all new narrower rear suspension arm holders and longer rear arms for increased stability & grip. There is a new 4-shoe clutch with significantly improved gear-shifting, better engagement, improved acceleration & reduced wear, while on all 4 corners there is updated shock membranes with reduced air gap and an all-new shock cap with 4 vent holes to compliment the new shock membrane. A longer rear camber link and the inclusion of 2.8mm front and 3.0mm rear anti-roll bars complete the changes. 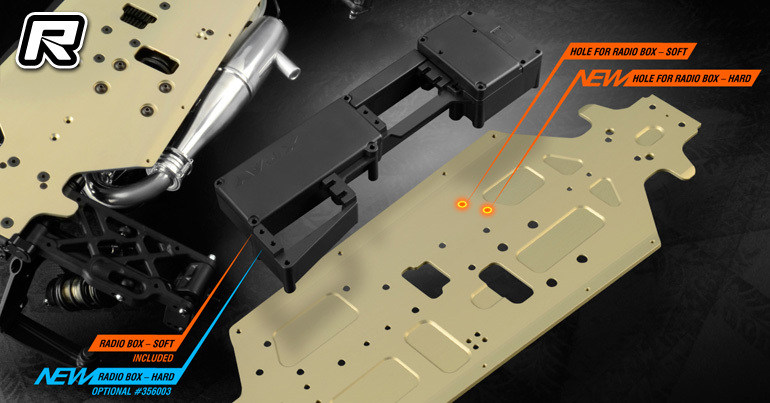 The new XB8 chassis was redesigned to fit both Soft and Hard composite radio boxes without modification. The included Soft radio box allows more chassis flex and is suggested for most standard track conditions. The optional Hard radio box increases vehicle stability and is suggested for very high temperature and high traction conditions. The chassis is CNC-machined from 3mm high-quality Swiss 7075 T6 aluminium, strategically machined in low-stress areas, and then anodized to make it as light as possible without affecting strength or rigidity. The all-new high-volume differentials were developed to improve vehicle control and consistency over long runs and enhance reliability. The differentials feature larger capacity cases, and larger internal gears with more teeth for improved differential moment. The larger oil volume and the shape of the gear teeth reduce overheating. The diff pins have a new, stronger design to improve reliability. 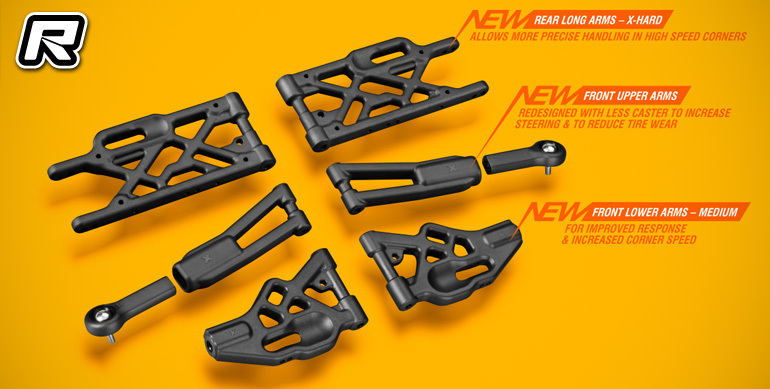 All-new front lower and upper arms are moulded using a harder material to improve response and to maintain bind-free suspension movement in dusty or hot conditions. The longer rear arms help create more forward traction and allow quicker acceleration out of the corners. The rear arms are also moulded from an extra hard material for consistent and responsive performance. The updated front upper arm geometry allows for less caster to improve the steering characteristics, increase the overall steering and help reduce tire wear. All-new front upper arms with less caster improve the steering characteristics, increase the overall steering and reduce the tire wear. The rear uprights feature new larger outer 8x16x5mm ball-bearings for increased reliability and life-span. To expand the set-up alternatives, an additional lower roll-centre adjustment position was added. The smart design allows the same upright to be used on both left & right sides. The wheelbase position is adjustable using 2 shims along the lower suspension pin. The rear uprights feature integrated geometry adjustments including: camber, upper and lower roll-centre and wheelbase. The narrow rear suspension holders work together with the new longer rear arms to improve overall grip, forward traction and allow earlier acceleration at corner exit. Clutch performance is critical to engine operation, fuel mileage, throttle control and traction. 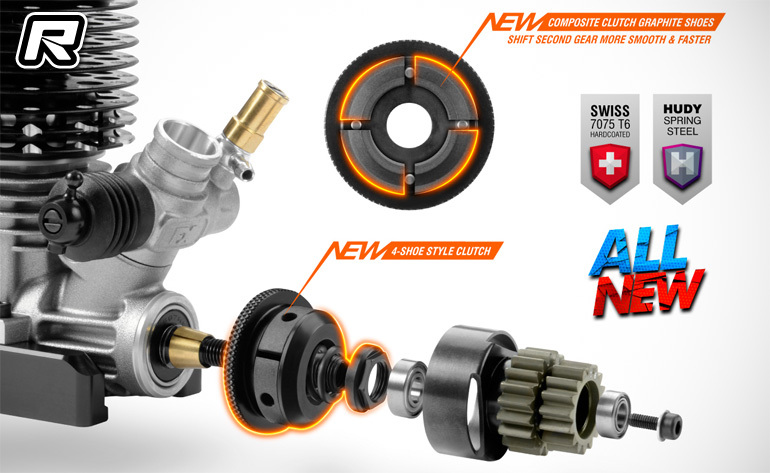 The all-new adjustable, 4 shoe clutch improves clutch bell engagement for better engine response and improves throttle feel. The clutch design features 4-shoes machined from a graphite material. The clutch setting can be tuned with the adjustment nut to control the engagement point as desired. 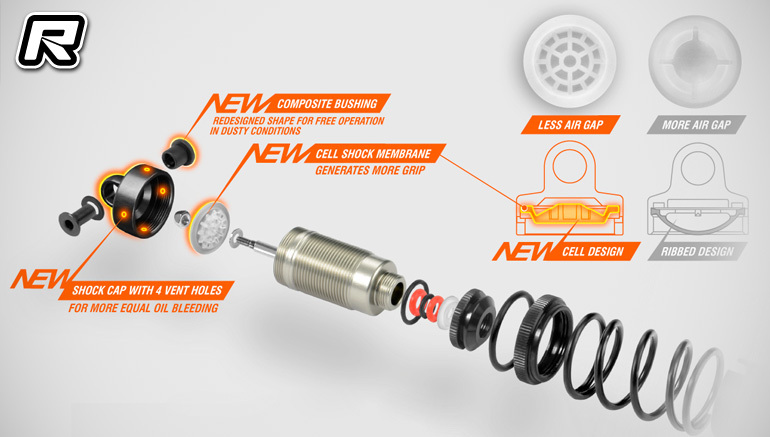 The GT shocks were redesigned with new shock caps and cell shock membranes. The all-new shock caps feature 4 bleeding holes for more equal oil bleeding and a more precise shock rebound setting. The cell shock membranes have less air gap that helps to generate more grip. The redesigned shape of the composite bushings result in free operation even in dusty conditions. Oversized big-bore shocks featuring 16.2mm I.D. shock bodies are externally threaded with an adjustable collar for quick & easy spring preload adjustment. The shock bodies are hard coated in a titanium colour and feature a 1-piece alu shock cap. The larger front and rear anti-roll bars help control chassis roll, increase corner speed and improve the stability of the car. The front & rear roll bars are easily mounted to the bulkheads and can be adjusted using the connected linkages. Manufactured from spring steel material, anti-roll bars of different thickness are optionally available for fine-tuning. Find the full presentation here.